In How to Save a Constitutional Democracy, Tom Ginsburg and Aziz Z. Huq focus on the structural forces that can break democratic societies and the role the constitutional system plays in democratic failure as well as its prevention. The book’s clear and engaging approach makes it a valuable contribution to scholarship on democracy and authoritarianism, recommends Lorenzo Canepari. How to Save a Constitutional Democracy. Tom Ginsburg and Aziz Z. Huq. University of Chicago Press. 2018. Have you recently opened your morning paper and found alarming news about the undemocratic behaviours of eminent political leaders? Have you also felt worried and intellectually frustrated due to the difficulty of understanding how the political situation has developed and how it should be managed? If yes – and it does not sound unlikely – you are not alone. 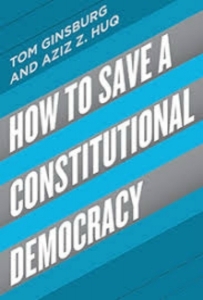 The comparative constitutionalists Tom Ginsburg and Aziz Z. Huq share your concerns and have written a brilliant book with a catchy ‘do-it-yourself’ title: How to Save a Constitutional Democracy. Despite its name, they do not offer simple recipes in the book. Instead, they focus on the structural forces that can break democratic societies and the role of the constitutional system in democratic failure as well as in its prevention. Their argumentation is carried out with the help of the juridical comparative method and is supported by analysis of statistical data drawn from other sources. In the aftermath of World War Two and during the Cold War, scholars including Juan Linz, Hannah Arendt and Carl Joachim Friedrich produced a great number of influential and in-depth studies dedicated to the analysis of authoritarian and totalitarian states and societies. Their works explored the historical and socio-cultural roots of these forms of government and indirectly contributed to the comprehension of democracy and its reciprocal relationships. Nevertheless, they did not focus specifically on the issue of the transition to and from democracy. Even after the end of the Cold War, when many countries adopted democratic institutions and interest in democratisation processes grew, scholars’ concerns were mainly related to the fragility of new democratic governments. The potential failure of the most consolidated democracies was rarely in question. A number of years have since passed and the world today looks much different, but the topic of the authoritarian transition from democracy is still perilously underexplored. Huq and Ginsburg address this issue. Their book unfolds through three main sections. They focus respectively on the core concepts necessary for the analysis (Introduction and Chapter One); the description of democratic failure’s pathways (Chapters Two to Five); and on the way the constitutional system can facilitate or prevent them (Chapters Six and Seven and Conclusion). Both the second and the third parts include chapters (Five and Seven) specifically focused on the US. Despite offering less in terms of theoretical depth, they provide the reader with an outlook on the ways the ideas that have been elaborated previously can be applied in detail to a concrete context. Chapter One, which is the heart of the first section of the book, paves the way for the development of its arguments. It does so through the definition of the concept of ‘liberal constitutional democracy’, the democratic governmental model that the authors campaign for. From the juridical perspective, its core components are three-fold: periodic free and fair elections by universal suffrage whose results are accepted by the involved political parties; liberal rights of speech, assembly and association, closely related to the practical exercise of democracy; and judiciary and administrative apparatus that works according to the criteria of the rule of law. When in the second section the authors do discuss how liberal constitutional democracies die, their main concern is the way they can slowly decline. According to them, sudden breakdowns due to coups are very unlikely in countries with long-term democratic traditions, a high degree of wealth and the absence of deep social cleavages within the population. On the contrary, decay challenges democracies insidiously and much effort is dedicated to the scrutiny of this in Chapter Four. The same logic of democratic competition can start the process of democratic erosion, which is often hardly detectable. Its result is the birth of illiberal democracies and competitive authoritarianisms: polities where there are potentially competitive electoral systems, but this is combined with major flaws in the protection of individual rights or in the application of the rule of law in the judiciary and administrative systems. Decay has two main forms: namely, charismatic populism and partisan degradation. The former is defined by the prevalence of political forces that act according to the assumption that the people’s will cannot be effectively represented by pluralistic mediation and the formal democratic process. They offer instead the intermediation of a charismatic populist leader, who ends up being concretely above formal procedures. Partisan degradation is a deterioration of the competitive party system. It is usually associated with the overwhelming successes of single political formations, which then start lacking incentives to respect the rules of fair competition. In both these cases, the dominant political forces do not attack the three institutional democratic pillars directly, but instead follow an aggregative approach, eroding them step by step behind the screen of formally legal policies. These political actors typically follow five techniques: constitutional amendment; the weakening of the checks operated by courts and parliaments; the centralisation and politicisation of the executive powers; the shrinkage of the action of media and associations; and interference in the regular course of the elections. In Chapter Six, the authors suggest some institutional designs that can prevent erosion in these delicate areas. Among them, it is worth mentioning constitutional amendment rules that imply the involvement of multiple legislatures and institutions with different constituencies; the parliamentary form of government; and the constitutionalisation of a network of checking institutions, of independent bodies for the appointment and the removal of the judiciary and of independent electoral commissions. Huq and Ginsburg’s arguments are clear and straightforward and their work is engaging and enjoyable. They are aware that their topic is too complex to be exhausted by a single book, so they refuse this aim from its beginning and feel free to play with some crucial trade-offs. One of them is related to the engagement with the comparative method. They give their work a global fashion, mentioning the recent constitutional history of many different countries like Hungary, Israel, Venezuela, Colombia, Thailand and Japan. However, they only deepen their analysis in the case of the US. If they had done otherwise, it would perhaps have overloaded the book, but their choice affects the quality of the comparison. A more dramatic compromise is related to the model of democracy that the book works with. The concept of liberal constitutional democracy is intentionally minimalistic in order to give it general value and make it more adaptable to different contexts. Nevertheless, the constitutional principles related to substantial equality and the welfare state have also been at the core of the most representative democratic systems at least since the second half of the twentieth century. Their exclusion risks banalising the complexity of contemporary democracies and partially undermining the strength of the analysis that follows that definition. Ginsburg and Huq still manage to maintain a good balance and provide us with a much-needed contribution to scholarship on democracy and authoritarianism. The problem of the degeneration of government has already been explored since the ancients, such as Polybius and Cicero. The authors reclaim it for the contemporary era and it confers on the book both a strong commitment to the present and some kind of classic flavour. It is definitely a valuable reading for specialists – who can also exploit an exceptionally detailed critical index – as well as for all responsible citizens. This review gives the views of the author, and not the position of Democratic Audit. It was first published on the LSE Review of Books blog. Lorenzo Canepari finished his Master’s Degree in Law at La Sapienza University of Rome in 2017, with a thesis about the constitutional history of Bosnia and Herzegovina. In September 2017, he moved to Scotland and started a Masters in Nationalism Studies at the University of Edinburgh, which he concluded in August 2018. Currently, he is still in Edinburgh as a PhD student in Sociology, with a project about the transmission of memory in the communities born from Istrian and Dalmatian exodus in the aftermath of World War II.